It’s getting pretty cold here in our area these days, and not only that, it’s been windy and rainy too! Baseball and Zooey enjoy watching the stormy weather from inside their warm and cozy house, but unfortunately, not all cats are as lucky as they are. In fact, some cats will be forced to fend for themselves for the entire winter. However, there is something you can do to help. 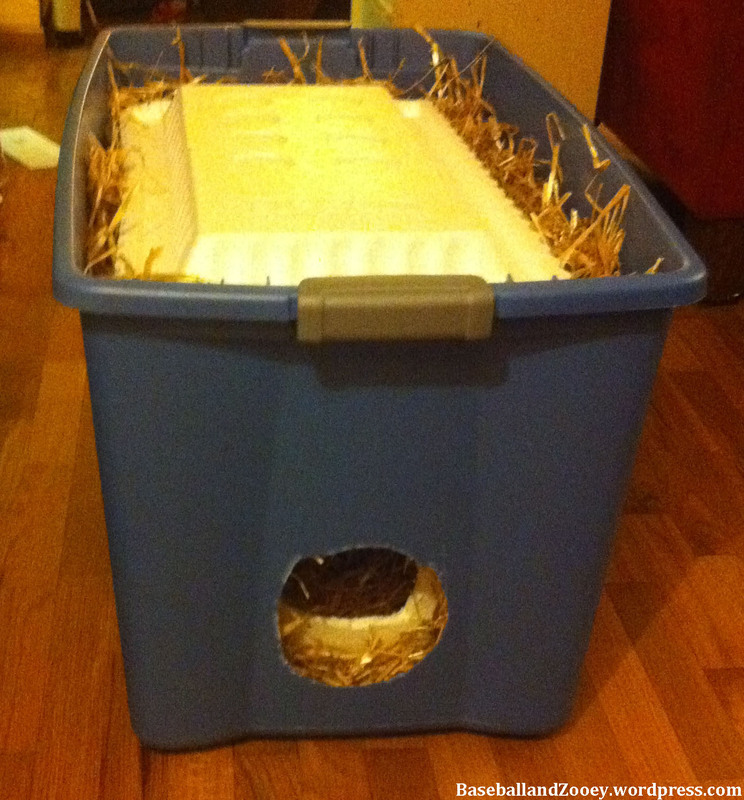 Simply combining a styrofoam cooler, a rubbermaid container, and some straw can create something called a “roughneck home” and will provide a warm shelter that will keep strays and ferals out of the elements. We made a couple ourselves, just the other day, in fact! When the neighbors across the street moved, they abandoned their four outdoor cats. Baseball and Zooey would often sit in the front window to check out the view, and eventually they attracted the attention of the strays. Sadly, the cats have all suffered from abuse at one time or another, and after several years of diligent cooing and feeding on Mom’s part, they’re still too skittish to even be pet for the most part. So until Mom can safely catch them and take them to the vet to make sure they’re not sick, and are safe to be around B and Z, they have to stay outside. *Note – This project requires adult supervision. Be sure to ask your parent or guardian for help before beginning. Then, place the lid on the cooler and tape it down to ensure a good seal. 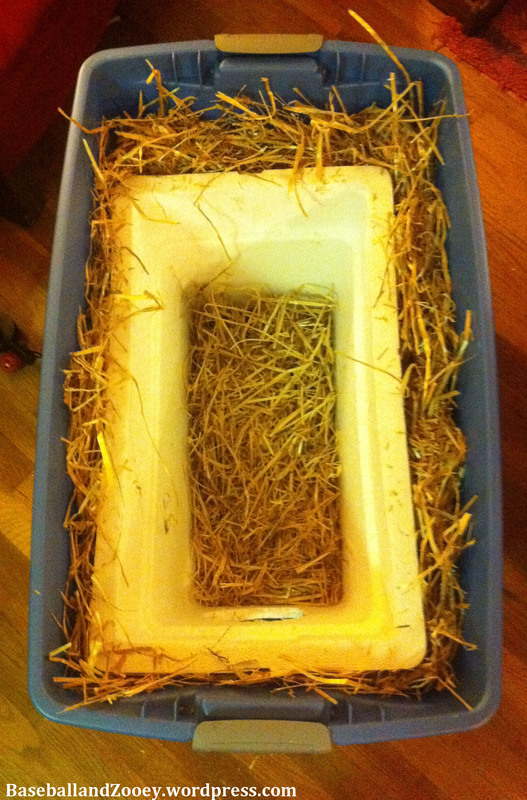 Add a layer of straw, and snap on the top of the plastic bin. Voila! You’ve made you’re very own roughneck home! Now go stick it outside near where you notice the cats hanging out, and see what happens. To get more information about the roughneck homes program, check out Rubbermaid’s website here – and find out about their special pricing deals for those interested in building shelters! Although colonies of stray cats and those who take care of them can be a controversial topic, we at The Adventures of Baseball and Zooey applaud the efforts of those who are working to take care of this huge problem. However, we also believe that all caretakers should be responsible. Please check your local city/state ordinances to make sure that you are following the laws in your area – they are there to keep both animals and people safe. 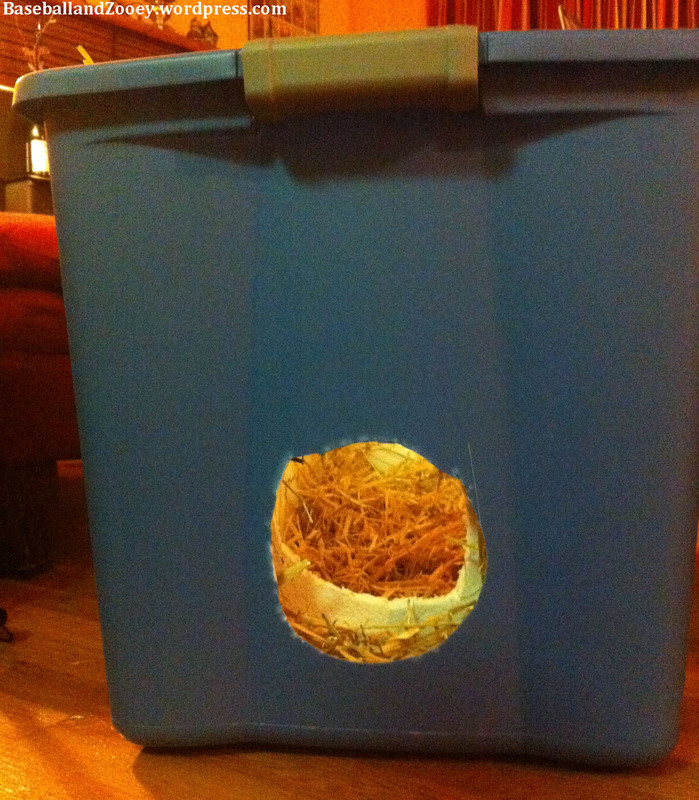 Also, check out sites such as Alley Cat Allies for information on the best way to support a stray cat colony (read their Colony Care Guide here). Be a help, not a hindrance!